Car dashboard analogy has been used for building organization’s dashboard for ages. Gauges have been the symbolic representation of this analogy and has taken a significant part of dashboard development for decades. Because of its simplicity and familiarity, this has been the umbilical cord for transitioning users to this digital dashboard world. It’s interesting to see that nowadays the digital displays are replacing the traditional car dashboards & gauges. Time is of the essence in all organizations. Any chance to present information quickly and meaningfully is a chance to drive quick decisions in your organization. Gauges provides precisely this opportunity. With one quick view, user can see exactly how much progress they’ve made toward key targets. 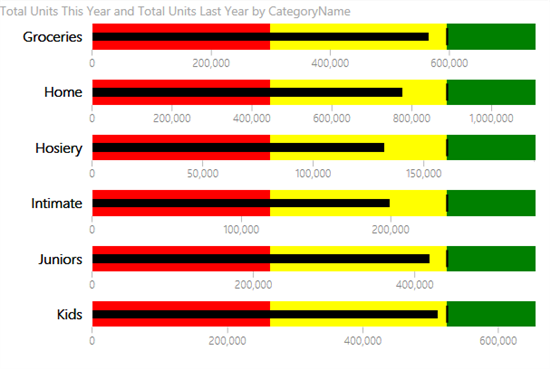 While there is passionate discussion about the use (or not to use) of gauges in the dashboard and how other visualizations such as bullet graph are a better fit for packing more information in concise space, We, at Power BI, leave this to the community. Not surprisingly, we delivered a bullet chart as custom visual and the community augmented it with traditional gauges, not just one, but with two, this week. CloudFronts Technologies contributed the DialGauge and MAQ software the LinearGauge. It’s fantastic to see visuals coming from the community and we really appreciate the effort put by these organizations. Dial gauge allows you define the min/max points for the gauge, the actual and target ranges to highlight in the dial along with the pointer value and percentage value to display. Of course, as the name says it looks like a nice dial. Duh! Linear Gauge is easy to use. Simply define your start point, target and the max width of the gauge to determine the major parameters of the data you’re presenting. 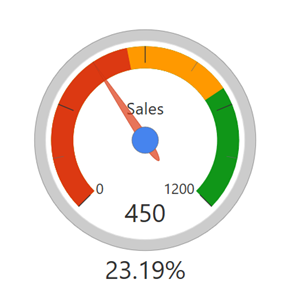 A color bar will show how much progress toward the goal has been achieved. You may also insert two trend details, such as your progress month-over-month and over the year. These details give context and a valuable at-a-glance illustration of how the current data maps against past performance trends. For passionate opponent of traditional gauges J, I am sure you would love the Bullet chart and hence we packed our Bullet chart with more capabilities since the initial launch. We now have category support, so you can bind to your table and display a bullet for each category. We also updated the formatting options with dropdowns, so you can feel less geeky about typing in the orientation acronyms. For those who are wondering, what is a bullet chart, just bing for ‘Stephen Few’ and ‘Bullet Graph’ and you can get to the entire design specification itself. If you need a short answer, a bullet chart is an efficient visualization for dashboards which features a single measure against a qualitative range. SQLBI has been an active contributor to the Power BI community with many great visuals. Cards with States is another handy one for displaying performance with 3 configurable states. Since the initial release, they have been continuously enhancing it based and a new version is available in the gallery now. With this updated version, you can either bind state ranges to measures or define it using static values. Performance label is also added which you can customize and turn on or off. 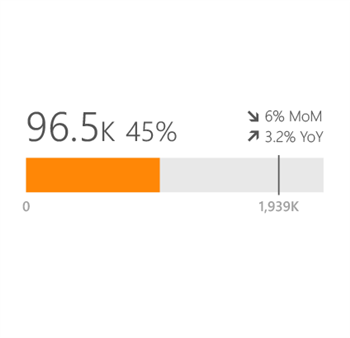 To use, simply download these visuals from the Visuals gallery and import it to your Power BI report and use it.